Villa Anita is an over 60 years old Istrian house built in traditional way using rough stones. The house was completely renovated in the year 2009 and during the reconstruction has been taken care of preserving the original atmosphere of the traditional Istrian house, but at the same time bringing the house at a higher level of comfort. Located in a quiet position 300 m away from the village, surrounded by woods and Istrian macchia, the house has an enclosed garden of 6.500 sqm where are situated summer kitchen with barbecue and a large, 50 sqm big swimming pool. The house owner does not live on the property. 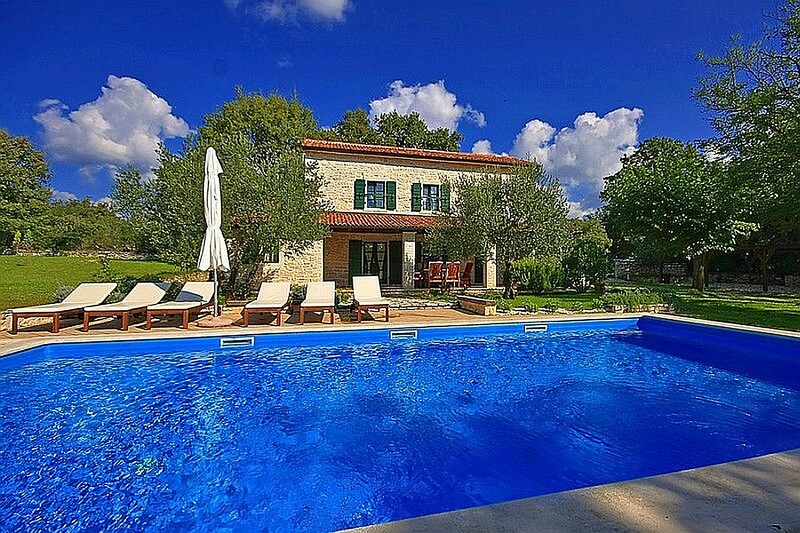 Villa with pool for 6-7 people with a total living area of 115 sqm situated on two floors. The ground floor consists of a kitchen, dining and living room with fireplace, satellite TV, sitting set and an additional bed, one double bedroom with french bed, shower/toilet. From the living room there is exit to the covered terrace with sitting set. At the first floor there are two double bedrooms with double beds, bathroom/toilet. Traumhaus - Traumurlaub! Tolle Alleinlage, Entspannung pur und trotzdem ist mit dem Auto alles gut erreichbar! Man kann sich in der Villa Anita perfekt erholen, es ist sehr ruhig und ausstattungsmäßig alles vorhanden was man benötigt. Die doch sehr abgelegene Lage sollte man , wenn man Kleinkinder hat, berücksichtigen. Im riesigen Garten ist ein Tischtennistisch, Grillbereich und eine Schaukel vorhanden. Insgesamt eine top gepflegte Anlage und sehr freundliche Vermieter.